Four months ago, we were at our wits end. Daughter, who was at the tail end of three years old, wouldn’t stay in her bed all night. She’d come into our room, beg to sleep with us, then beg for us to sleep with her. We’d sleepily say no, then do whatever was necessary to get us all back to sleep. That usually meant sleeping with her for awhile – several times. After all, once you crawl into their beds, kids notice when you get up to go back to your own. They wake up. And it starts all over again. She’d been out of her crib and in a bed for four months so this was an unwelcome hitch. After six weeks of this, I called the pediatrician for advice. But what if I did? Leave it my daughter to be the one child who takes it to the end. I knew I’d never have the heart to lock her in her room. And if we bought the lock, if I made it the consequence, I’d have to follow through. So, Husband and I debated and strategized what to do. An aside to discuss our toilet training strategy. Namely, we didn’t have a good one and after repeated attempts with little success, I tried a friend’s suggestion. If her son pooped in the potty for five days, he got a poopy party – balloons and all. Sound ludicrous? Have you recently toilet trained a child one month before her preschool starts where she must b out of diapers? It worked. We had a festive event on the back deck (I have pictures!) and she was good to go (so to speak) from then on. I had been saving a beautiful princess dress for Daughter’s fourth birthday. Maybe if we upped the ante for her to sleep in her bed all night, she’d come around. So, lock or princess dress? We chose the carrot. I made it short term and tangible, just like the doc said. After five nights sleeping straight through the night, she’d get a beautiful dress. She went for it. And four months later, she’s still sleeping in her bed all night. She’s had a few slip ups, but early on, keeping her princess dress made good collateral. And later, we told her we knew she could sleep through the night, she was such a big girl and all, and she reverted to her now better habit. The truth for us has been that kids turn any behavior into a habit quite easily. It takes a reward to break it, and then the better behavior becomes habit – and that’s hard to break. 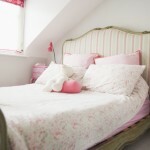 This week we decided to tackle Daughter’s troubles staying in bed after story time. She’d started to pop up and come downstairs until she wasn’t getting to sleep until 9 pm. Then she’d fall asleep in the afternoon the next day and repeat the cycle. Our offer? Five nights going to sleep on her own wins a prize. We just finished night three successfully. Time to go shopping.